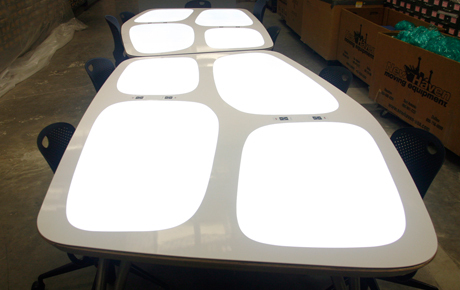 Elumanation Custom LED Light Panel Projects. 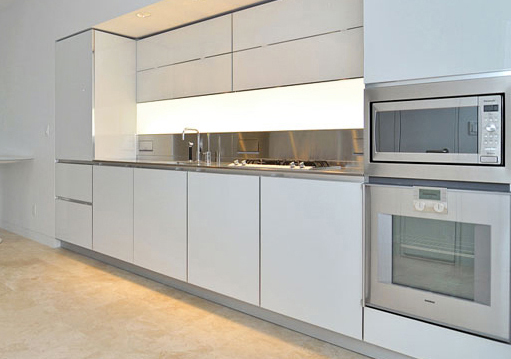 we frequently update our project gallery with new installation images. 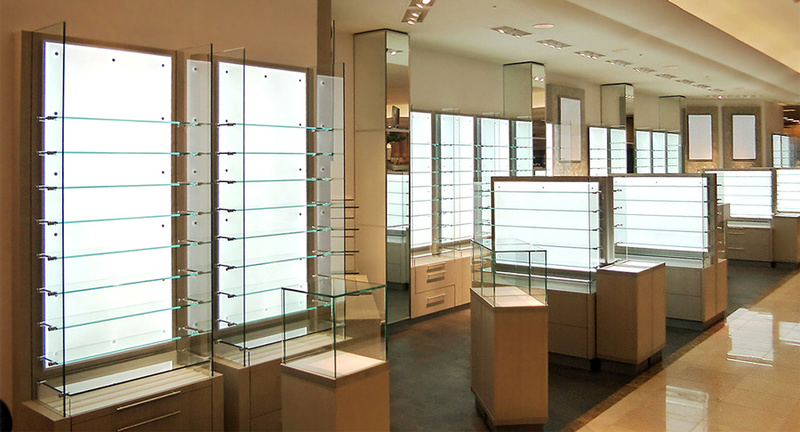 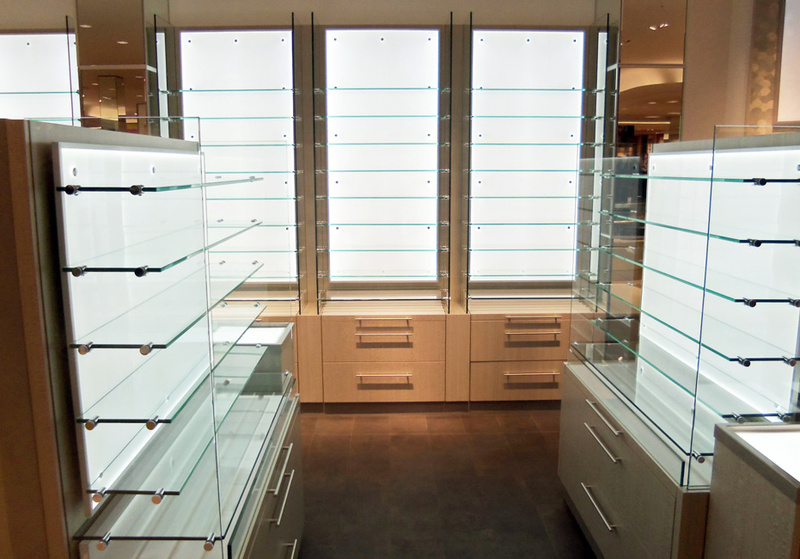 Diffused Elume LED Light Panel fixtures illuminate and enhance optical shelving displays creating a bright and unique retail environment across Dillard's department stores nationwide. 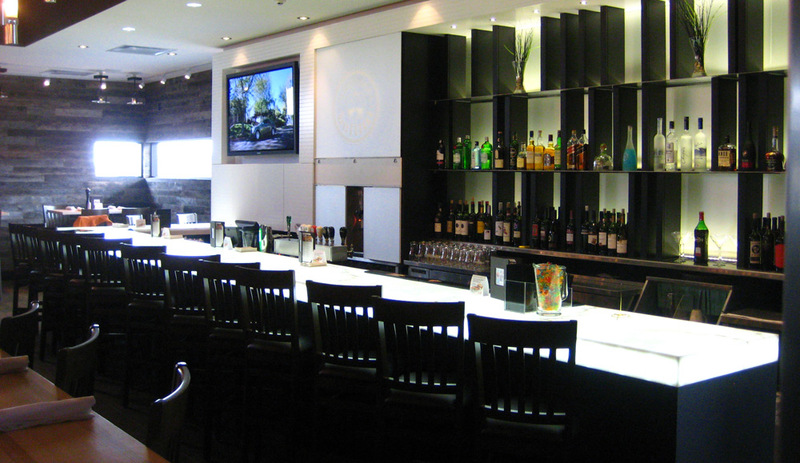 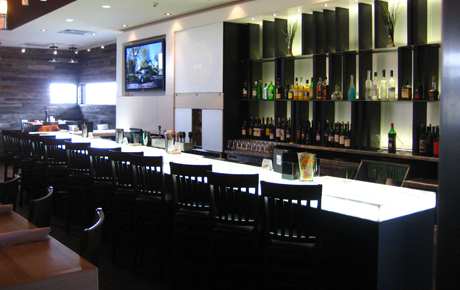 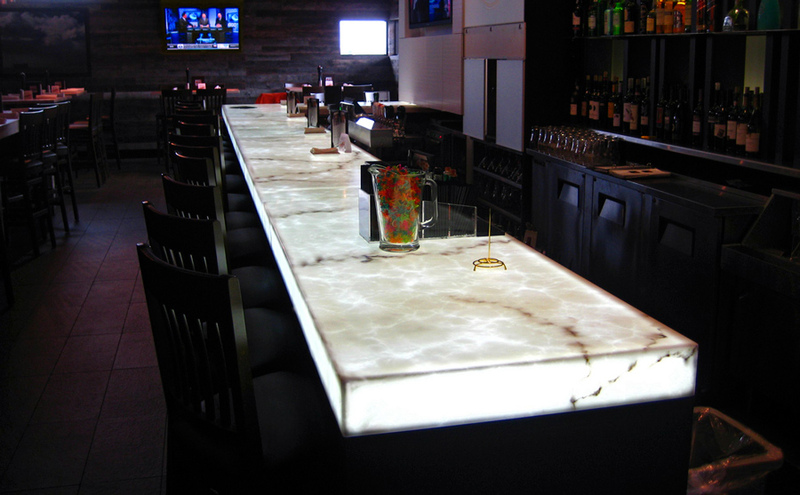 Custom onyx bar top back lit by our Elume LED Light Panels to create a bright, uniform illuminated, onyx feature at Milestone's Restaurants owned by Canada's largest full service restaurant company Cara Operations Limited. 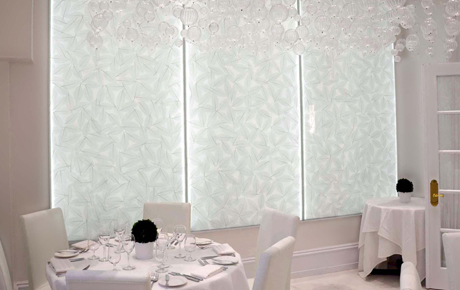 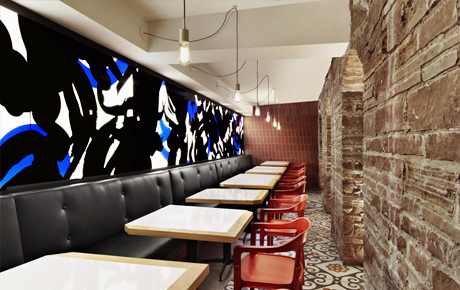 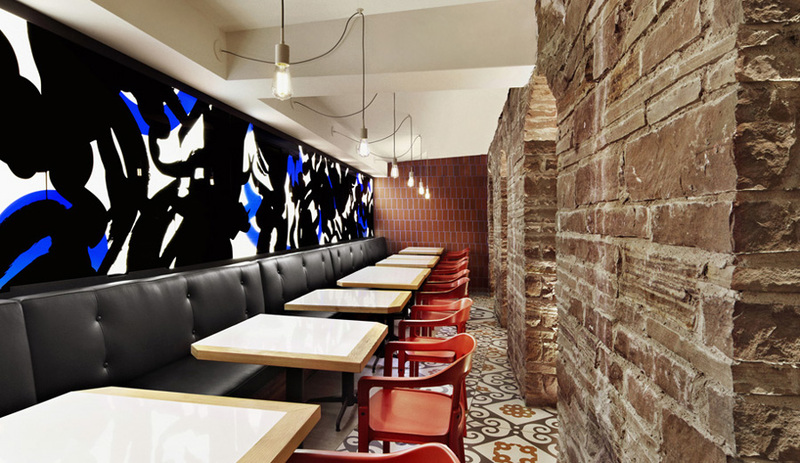 Translucent acrylic decorated with adhesive vinyl graphics are backlit by our LED light panels to create a seamless feature LED wall over the entire length of the bar in this 1850's historic heritage building's tapas restaurant. 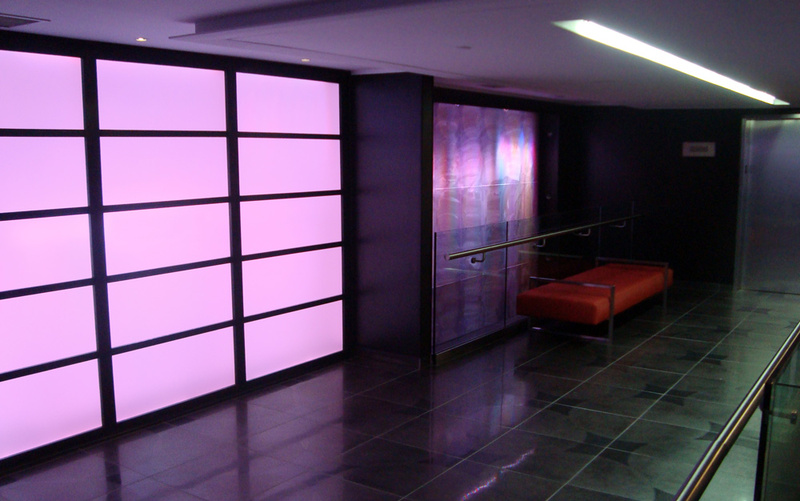 Vibrant, Onyx wall facade uniformly illuminated by our Elume LED Light Panel. 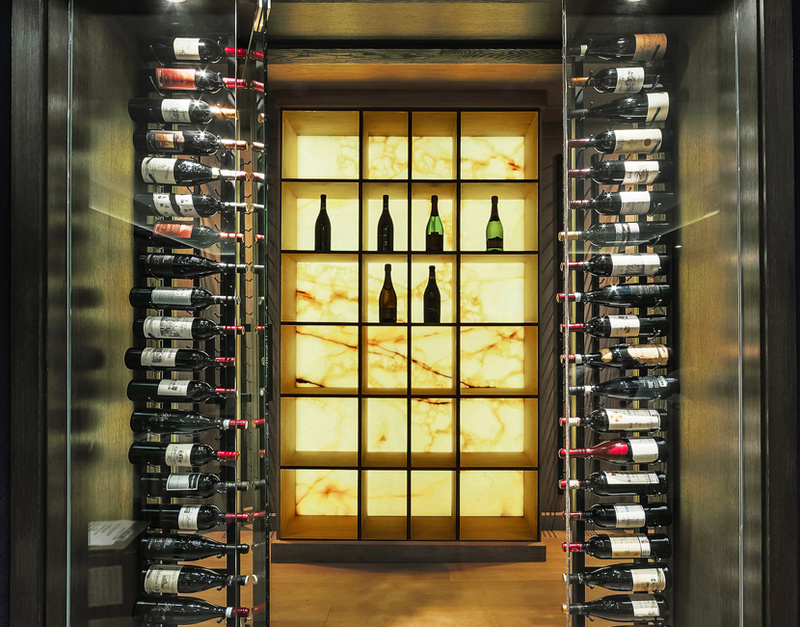 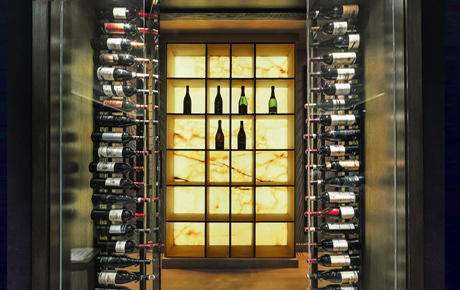 This project illustrates the large single unit dimensions we are able to achieve utilizing only one LED Light Panel in this wine cellar installation. 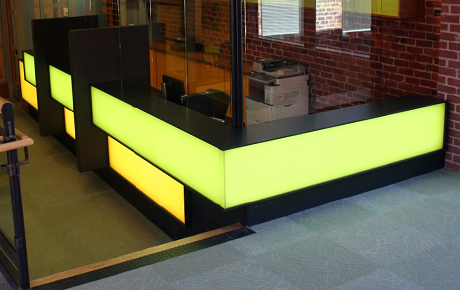 Translucent coloured acrylic uniformly backlit by Elume LED Light Panels to create this illuminated reception desk into an eye-catching architectural highlight. 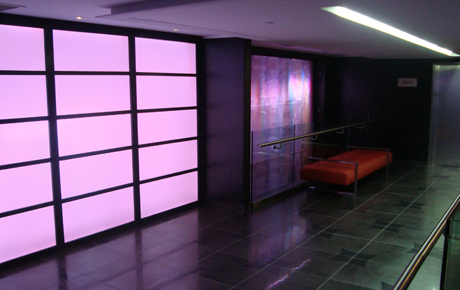 Elumanation fabricates the Pantages Hotel & Spa multiple RGB LED lighting systems to achieve a unique and DMX controllable lobby experience to welcome their guests and residents. 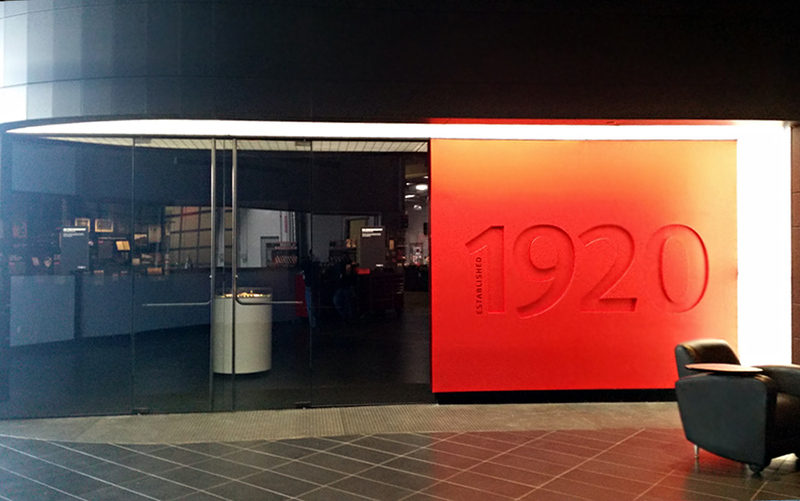 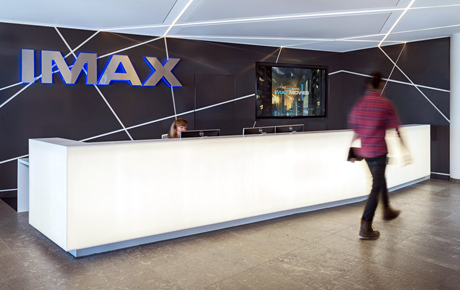 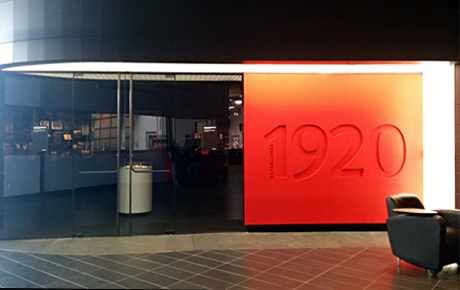 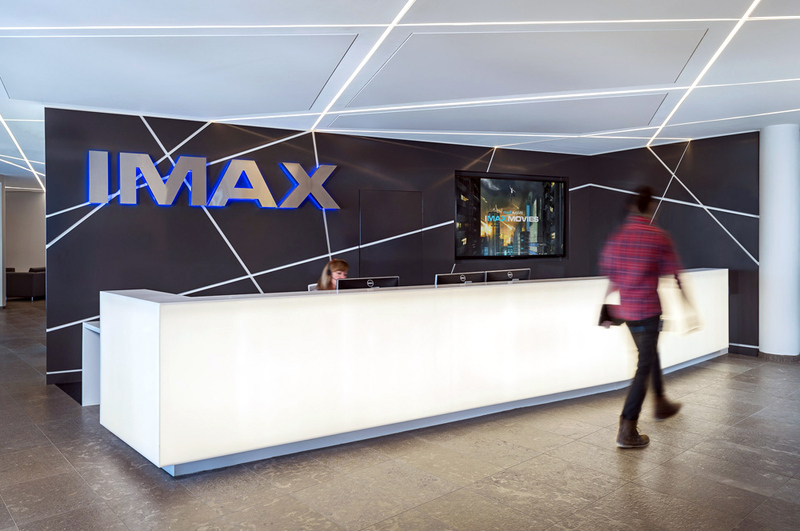 Designed and installed in collaboration with Noran Industries, DCL Woodworking and Quadrangle Architects, Elumanation provided Elume LED Light Panels for a seamless illuminated resin reception desk at IMAX's Canadian headquarters. 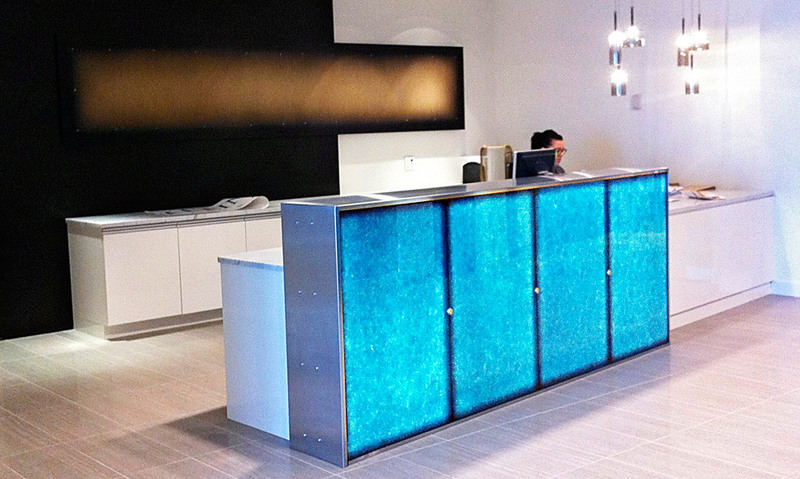 Translucent patterned Starphire glass uniformly backlit by Elume RGB LED Light Panels to create this illuminated Cube installation at the AMLI Lofts condominium complex. 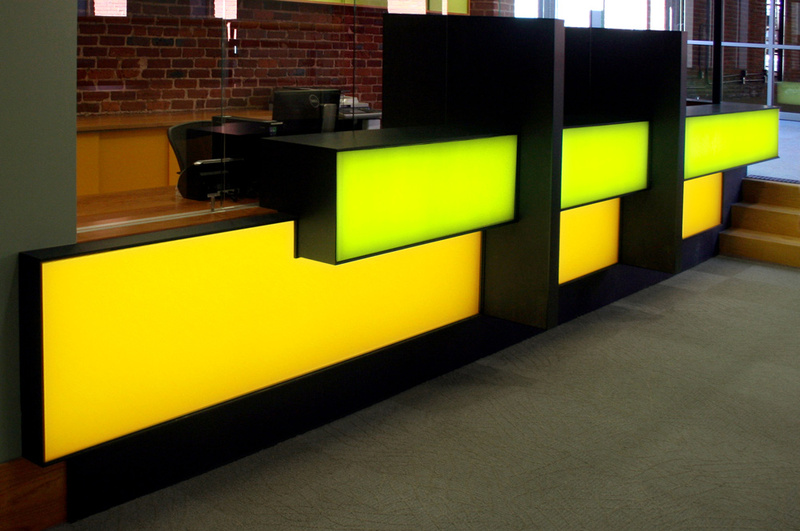 Project by Walsh Group. 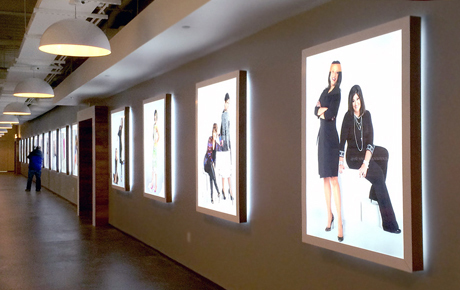 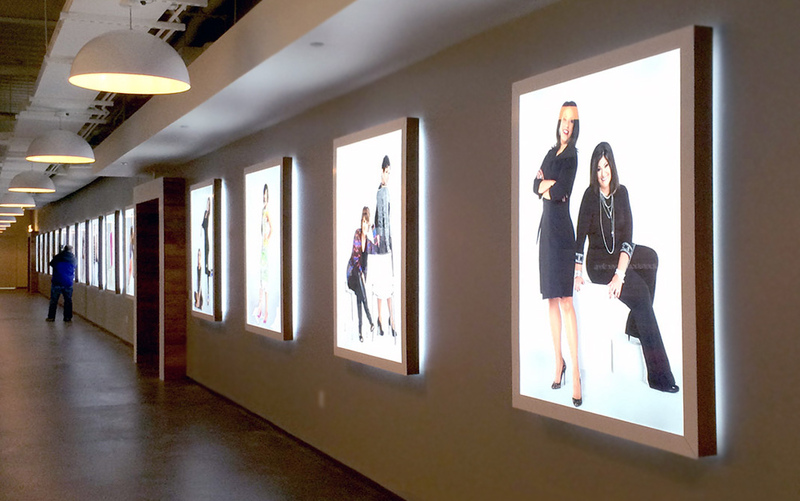 Custom poster boxes manufactured to illuminate QVC Television Network's artwork throughout their broadcasting headquarters. 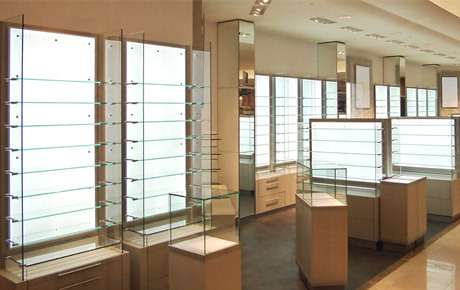 Elume magnetic slimboxes allow for simple artwork replacement as well as the additional customization to produce a halo light around each wall mounted unit. 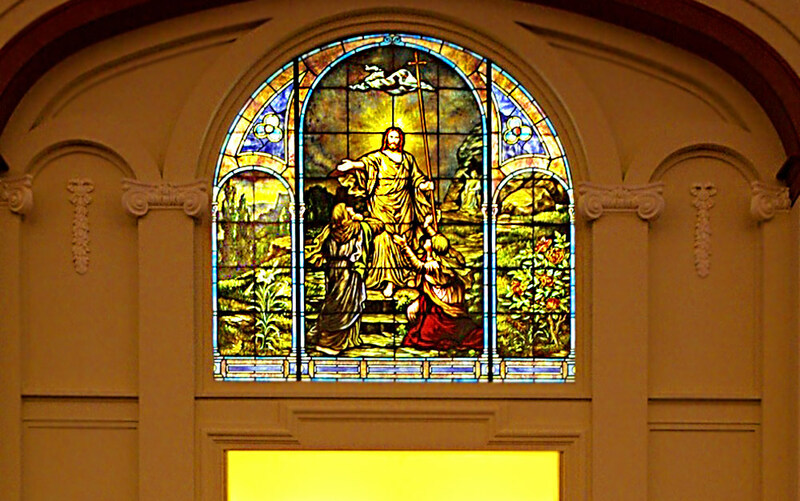 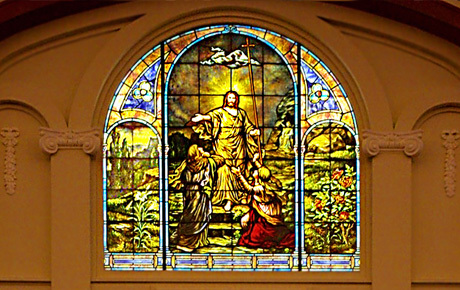 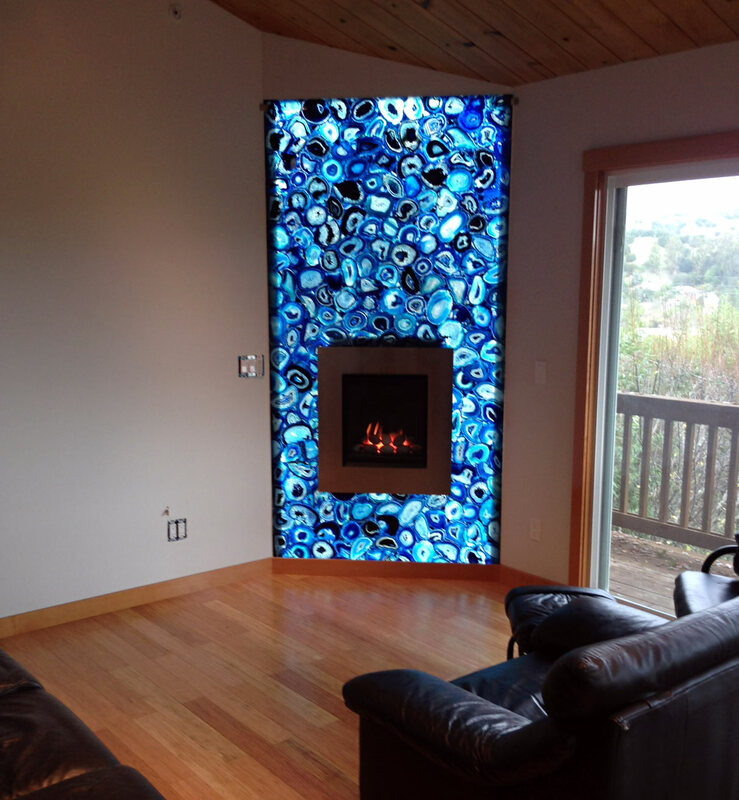 Stained glass installation backlit by our edge lit elume LED Light Panels recessed into the wall to create a vibrant stained glass piece giving the effect of bright daylight through the faux window. 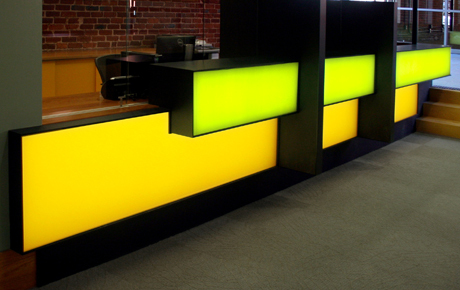 Project by Stanton Studios. 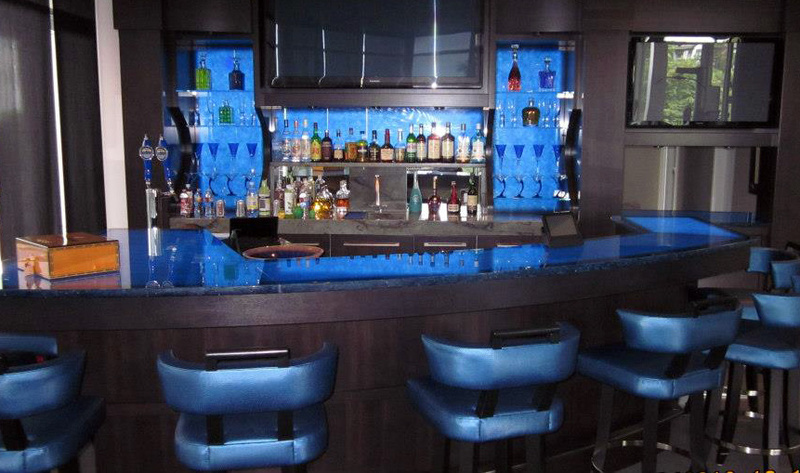 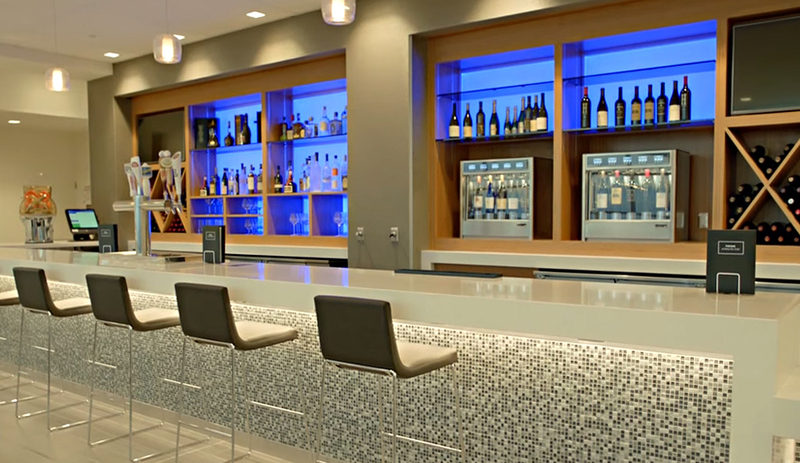 Colour changing RGB light panel backsplashes output dynamic RGB LED lighting effects behind the bar's illuminated shelving area at multiple Delta Airline's Sky Clubs. 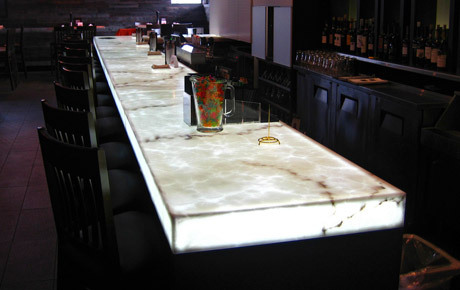 Bright, seamless countertops uniformly illuminated by Elumanation's thin, Elume LED Light Panels at the renowned Painted Rock Estate Winery's tasting room and events facility. 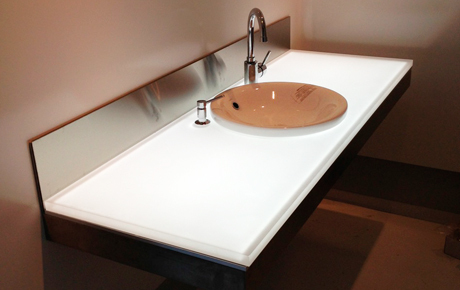 Thin Elume LED Light Panels brightly backlights this private residence's onyx countertop with minimal spacing required. Colour changing RGB light panel backsplash outputs dynamic, ambient LED lighting effects behind the bar's illuminated shelving area. 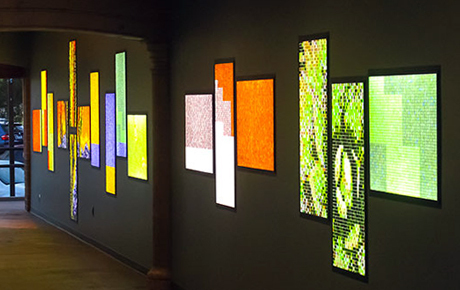 Utilizing custom shaped Elume LED Light Panels strictly compliant to the standards of colour transparency evaluation, Elumanation manufactured high output, next generation transparency LED slide viewing, light tables for Harvard Universities' Art Museum. 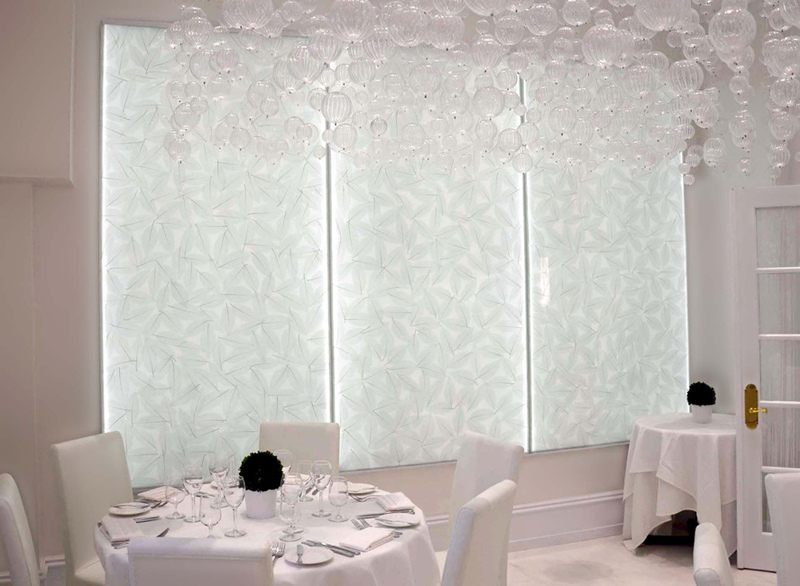 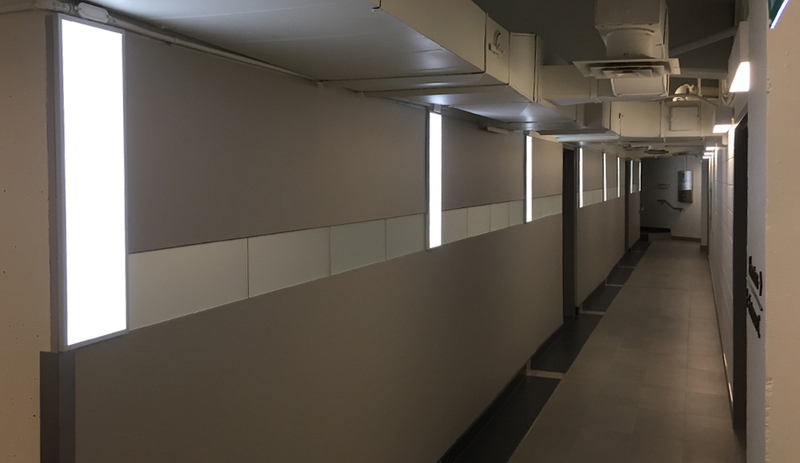 Beautiful backlit wall panel feature uniformly illuminated which illustrates the large single unit LED Light Panel's dimension's that we are able to custom fabricate. 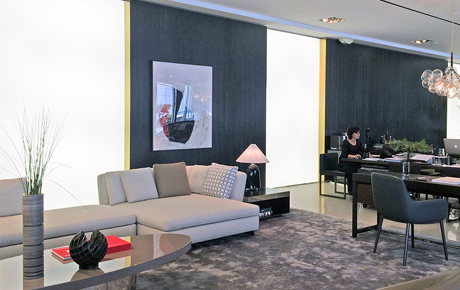 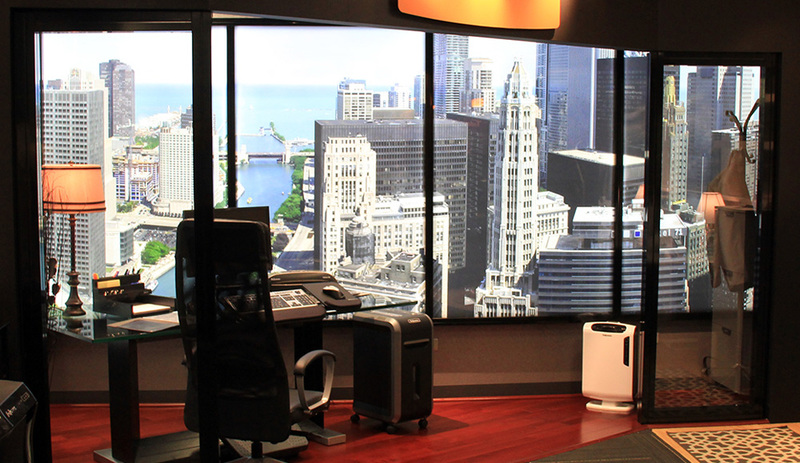 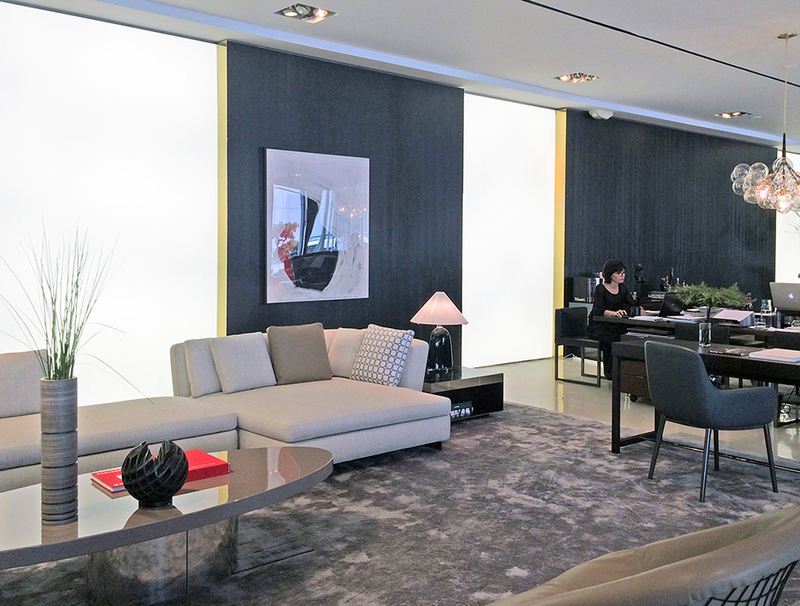 Elumanation provides daylight balanced Elume LED Light Panels to illuminate a graphic panoramic cityscape to bring a faux veiw to this private office space. 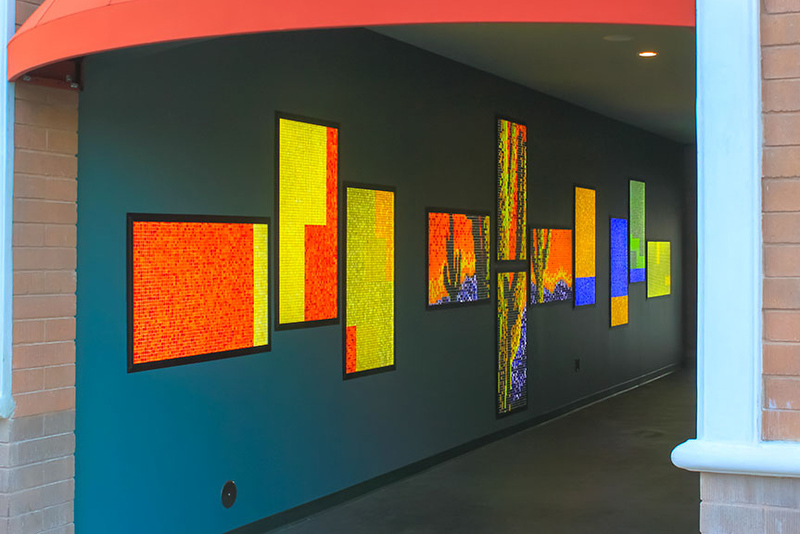 Coloured glass mosaic tiles backlit by our edge lit acrylic LED Light Panels recessed into the wall create stunning art pieces illuminating this commercial properties exterior hallway. 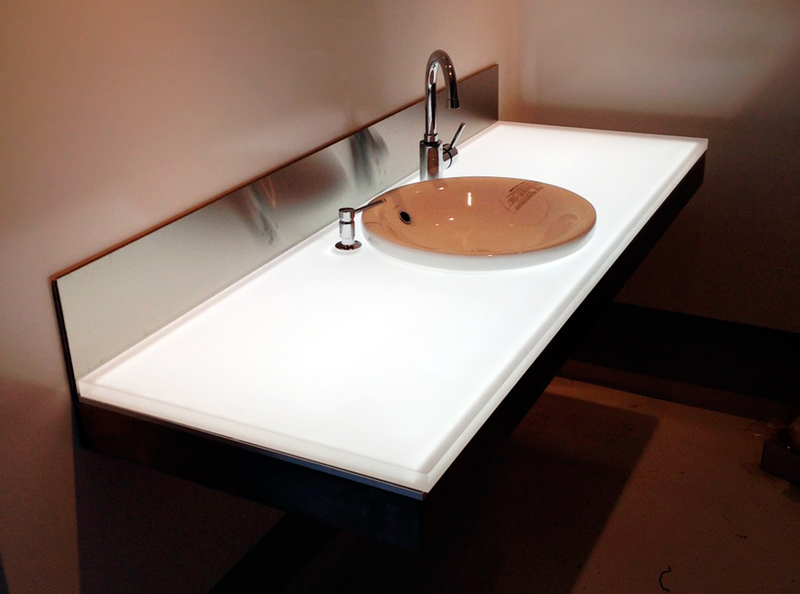 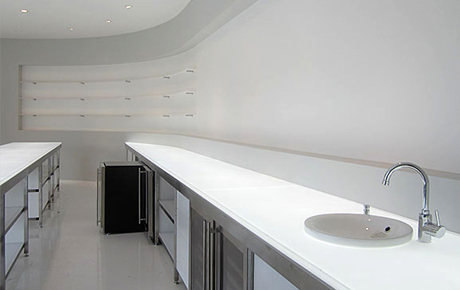 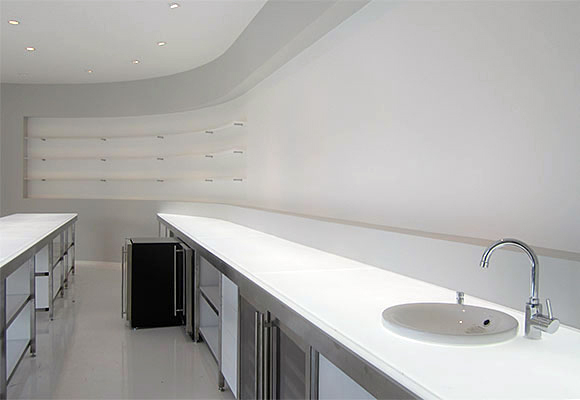 Our thin, Elume LED Light Panel brightly backlights this private residence's illuminated countertop complete with faucet and sink holes precut into the acrylic sheet during manufacturing. 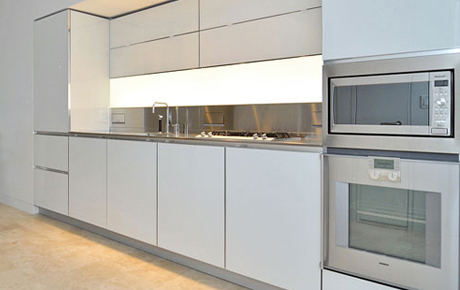 A soft, edgelit acrylic wall panel backsplash highlighting the kitchen's countertops throughout this multi-unit condominium property development. 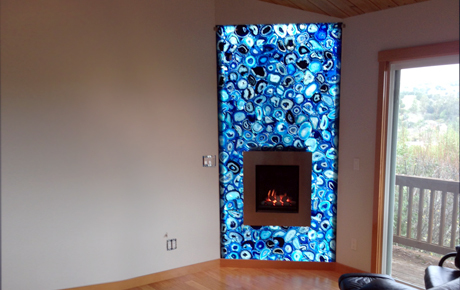 Elumanation provided custom Elume LED Light Panels to back lit this semi precious stone agate fireplace surround. 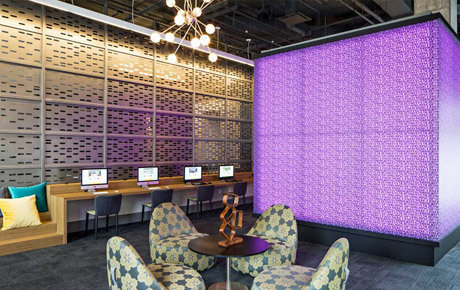 Bright LED Light Panels utilized to create unique illuminated architectural features at Snap On Inc's headquaters. 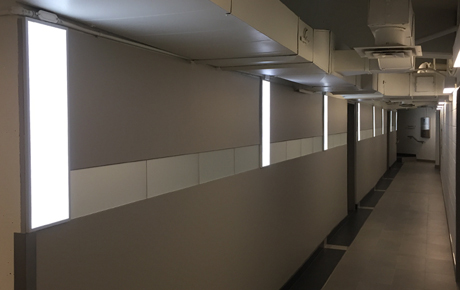 Custom diffused fixtures were fabricated to increase light levels in Royal Back of Canada's head office's parking garage hallways. 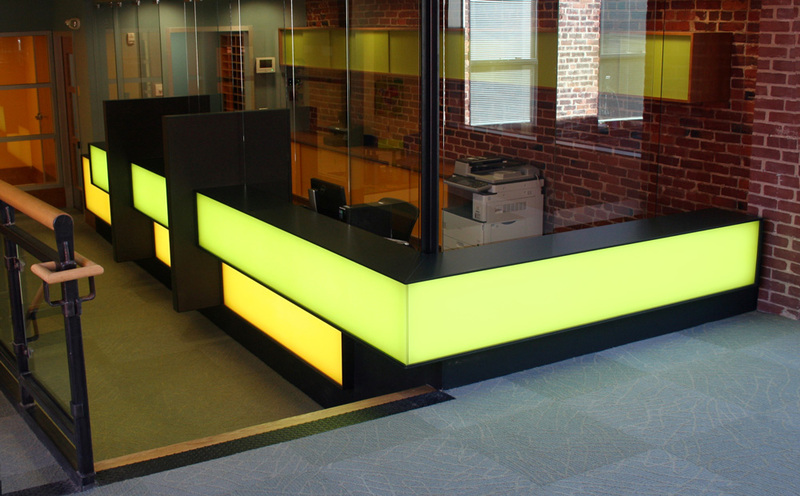 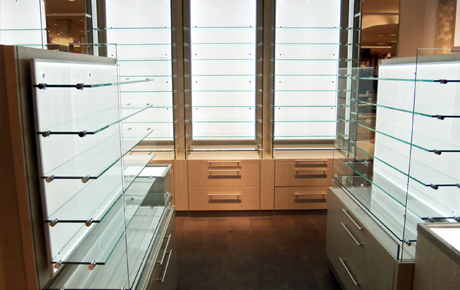 Our 0.5" thin Slimfixtures were ideal where a minimum dimensional footprint was a strict requirement of the project. 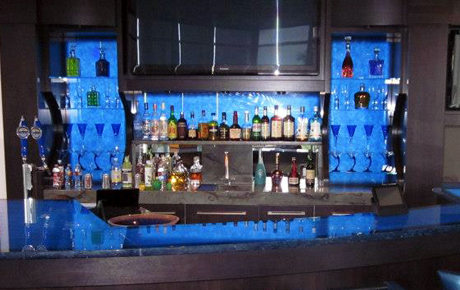 A private residence's backlit bar backsplash outputs an ambient light behind the bar's illuminated bottle shelving area. 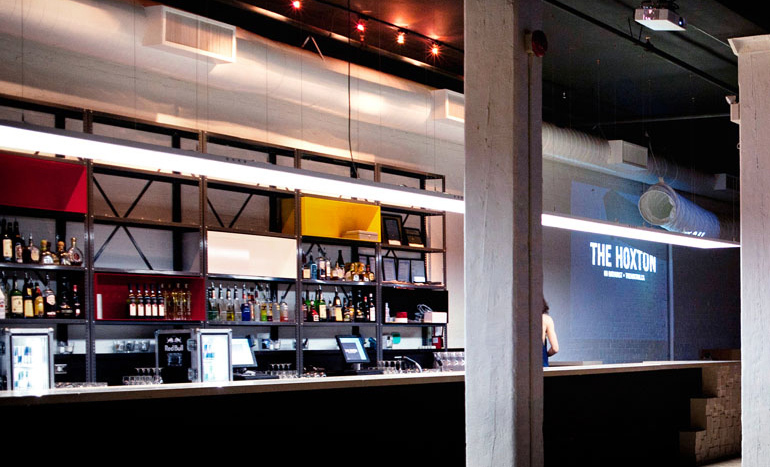 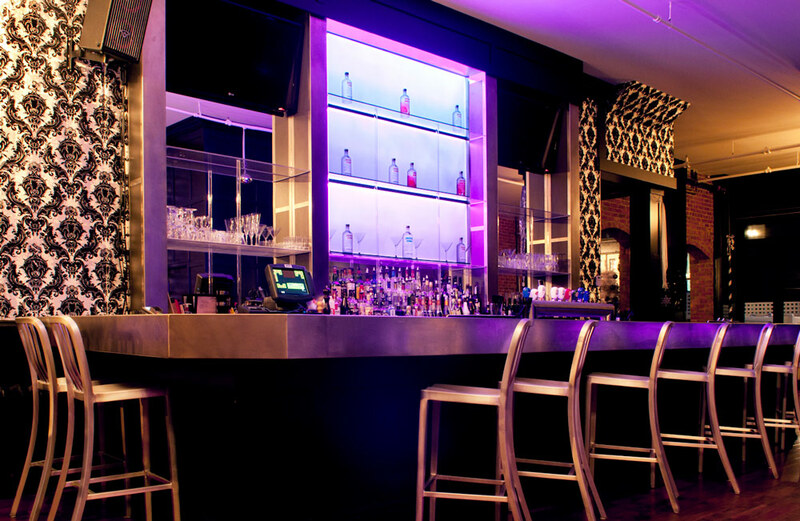 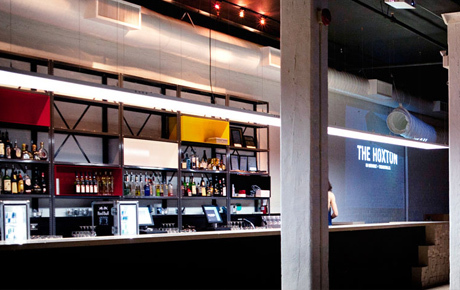 Elumanation in collaboration with Castor Design fabricates custom linear panel fixtures for The Hoxton concert venue and club space for their bar top illumination. 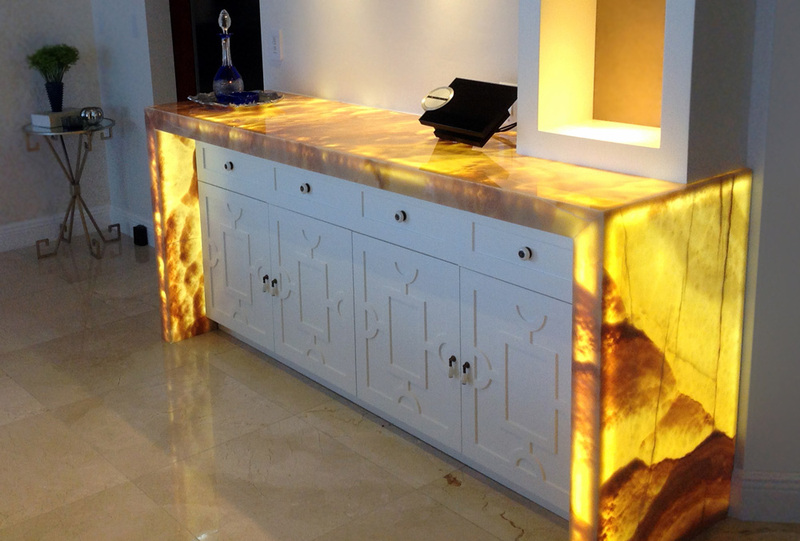 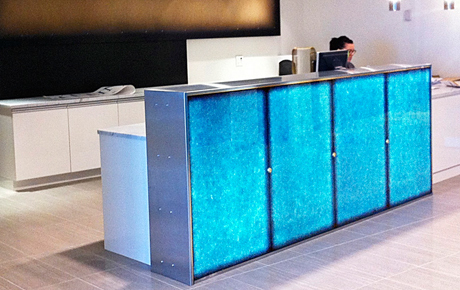 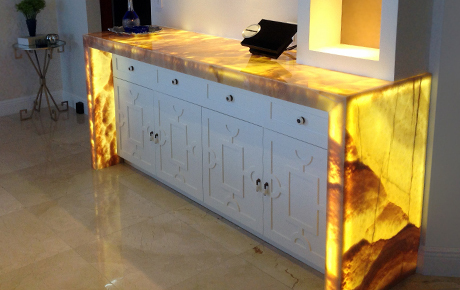 Translucent coloured glass uniformly backlit by Elume LED Light Panels to create this illuminated reception desk into an eye-catching architectural highlight. 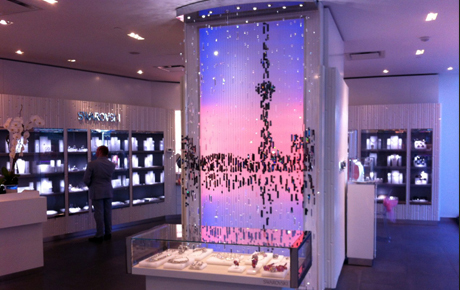 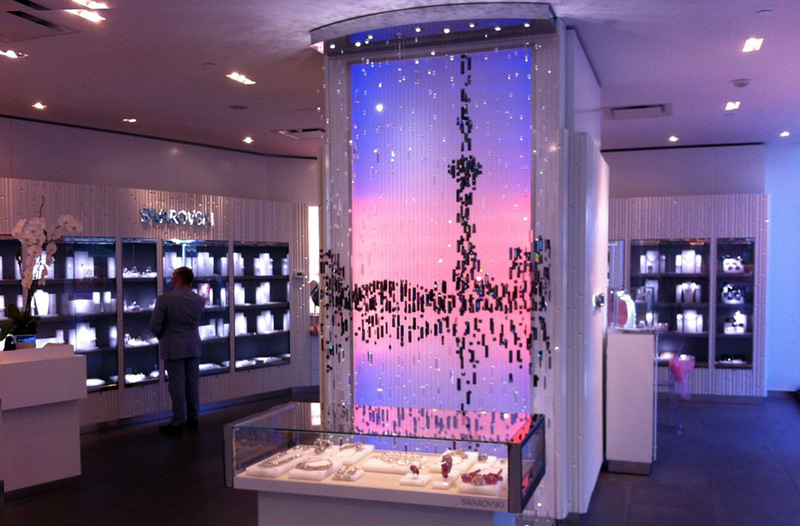 Elumanation develops a custom RGB LED panel lighting systems to achieve a unique and DMX controlled wall feature to simulate the sunrise and sunset while illuminating an arranged Swarovski crystal Toronto skyline. 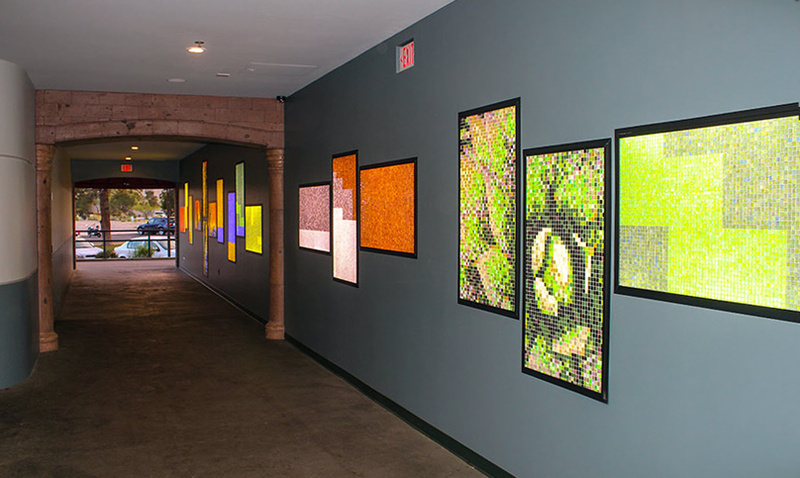 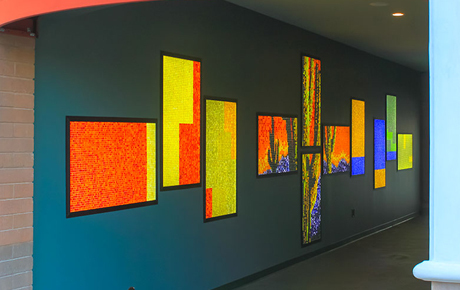 Coloured glass mosaic tiles backlit by our edge lit, recessed into the wall, acrylic LED Light Panels create stunning art pieces illuminating this commercial properties exterior hallway. 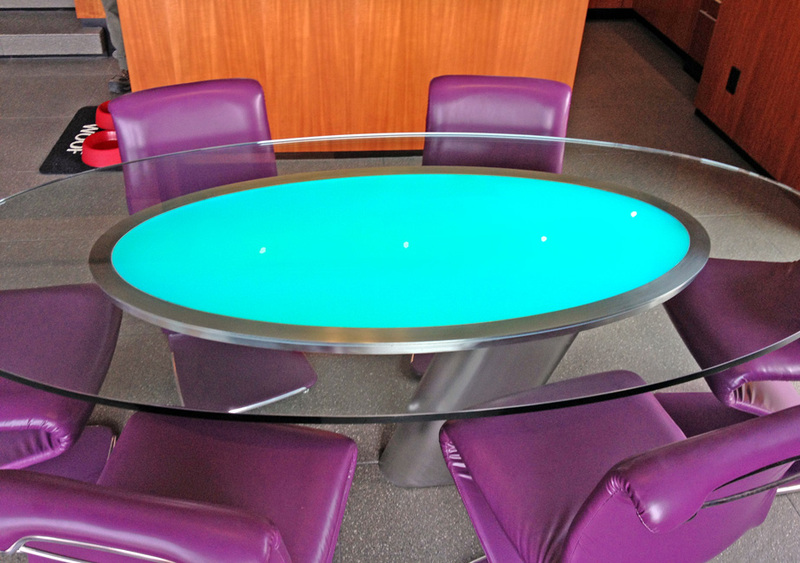 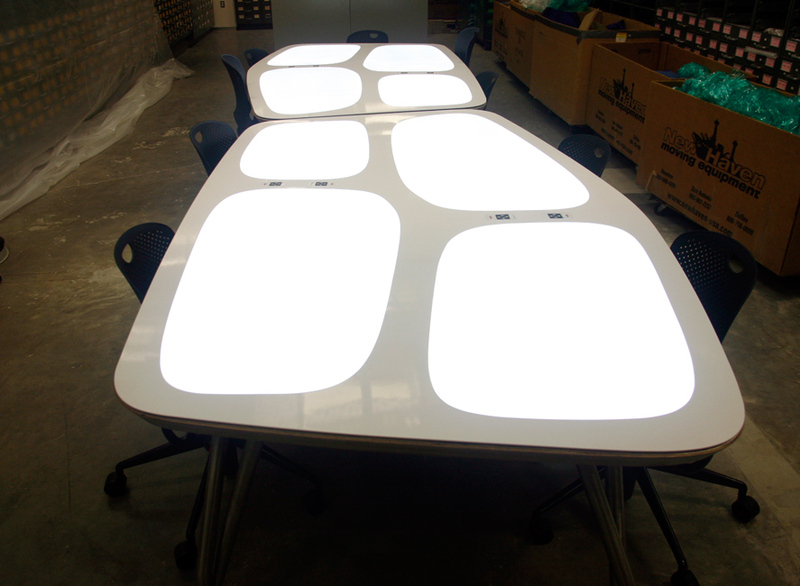 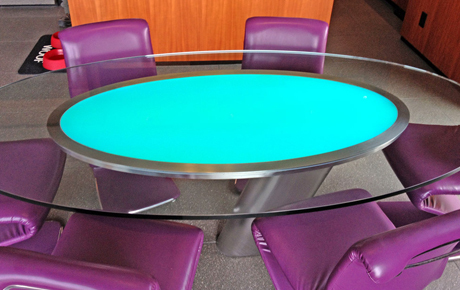 An ellipse shaped RGB LED Light Panel embedded in the center of this custom glass table outputs a variety of controlable, dynamic colour effects.